Difference between revisions of "Asterisk Conference Calls"
Using a headset vastly improves call quality for everyone. Microphones built into laptops and desktops are the number one cause of poor line quality when using VOIP. Even if more than one person is using the same computer a single headset microphone with the laptop speaker will usually pick up all the voices in the room and the call quality is far superior. # If you are using IDEFisk, use version 1.3X. Do not use version 2.0. Asterisk is an open source, free soft switch/soft PBX system for managing all manner of telephony needs. It is produced by Digium (http://www.digium.com/) as a method of marketing their telephony hardware. The Foundation is currently investigating using it as a conferencing solution. Asterisk is an open source, free soft switch/soft PBX system for managing all manner of telephony needs. It is produced by Digium (http://www.digium.com/) as a method of marketing their telephony hardware. The Foundation has rolled this out for projects to use. An installation of Asterisk exists on asterisk.eclipse.org configured by default to work as a conferencing bridge. Currently, to connect to the server clients are required to use an Internet Protocol-based softphone. In the future POTS (regular telephone) access could be provided on a cost basis. This page contains information on downloading and configuring the simplest of the available clients for use with the Foundation's Asterisk conferencing server. Currently, to connect to the server clients are required to use an Internet Protocol-based softphone. This page contains information on downloading and configuring the simplest of the available clients for use with the Foundation's Asterisk conferencing server. # Project Leads and PMC Members can use the [http://portal.eclipse.org Portal] to generate conference codes and PINs. See this [http://eclipsewebmaster.blogspot.com/2007/06/conferencing-is-coming.html Blog Entry]. #In order to test your client, we'll connect to a test conference. The conference number is "8976" and the PIN is "12345". If you successfully connect to the conference then everything is in order! **'''Cause:''' Everyone using a softphone on the call should use a headset or at a minimum an external microphone. Call quality can be drastically reduced by 1 person using a laptop built-in microphone. Please also refer to item number 7 in the setup instructions on how to configure Idefisk to support the best call quality. Additionally you can try flipping the filter setting between digital and analog gain detection for best results with your hardware. **'''Cause:''' Check that you are able to connect to the Internet with your web browser. **'''Cause:''' SIP clients may be blocked by the firewall's NAT configuration. Enter the real external IP address of your Internet router in the client's NAT configuration screen. IAX clients like Idefisk don't need this information. **<span style="background: #FFEEEE; border: #FF0000 1px solid; font-weight: bold; padding: 3px; font-size: large">NEW</span>'''Cause:''' IAX requires outbound UDP on port 4569. You may need to request that your firewall aministrator allow tihs traffic. * [http://www.sjlabs.com/sjp.html SJPhone] for Linux, MacOSX, WinCE and Windows - This is a SIP client and is harder to get through firewalls but the audio and call quality are fantastic. The GUI is less than stellar but setup is fairly easy. Project Leads and PMC Members can use the Portal to generate conference codes and PINs. See this Blog Entry. In order to connect to the Asterisk conferencing system you will need either a SIP or an IAX protocol client. IAX has a protocol advantage over SIP in that it automatically handles Network Address Translation (NAT) configuration. Since nearly all Internet users pass through a NAT gateway on their way to the Internet, we will focus on IAX. There are several usable IAX client but the most mature and simplest of these to use and set up is the IAX client Idefisk which is available from http://www.asteriskguru.com/idefisk/free . This client is available on Linux, Win32, and MacOSX. The screenshots below are from Win32 but the appearance and configuration are nearly exactly the same on all platforms and the defaults are usually correct. When presented with the following screen, select "Skip and go to manual configuration," then click "Next"
You will then see a screen like this, and you will just press "OK"
In order to test your client, we'll connect to a test conference. The conference number is "8976" and the PIN is "12345". If you successfully connect to the conference then everything is in order! Cause: Everyone using a softphone on the call should use a headset or at a minimum an external microphone. Call quality can be drastically reduced by 1 person using a laptop built-in microphone. 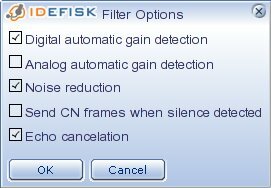 Please also refer to item number 7 in the setup instructions on how to configure Idefisk to support the best call quality. Additionally you can try flipping the filter setting between digital and analog gain detection for best results with your hardware. Symptom: I don't hear any audio. Cause: Sound may be disabled. Can you play any other sounds on your system? Cause: Networking equipment is blocking your audio connection. Does the client show that you are connected? Cause: Check that you have entered the address correctly. Cause: Check that you are able to connect to the Internet with your web browser. Cause: SIP clients may be blocked by the firewall's NAT configuration. Enter the real external IP address of your Internet router in the client's NAT configuration screen. IAX clients like Idefisk don't need this information. NEWCause: IAX requires outbound UDP on port 4569. You may need to request that your firewall aministrator allow tihs traffic. SJPhone for Linux, MacOSX, WinCE and Windows - This is a SIP client and is harder to get through firewalls but the audio and call quality are fantastic. The GUI is less than stellar but setup is fairly easy.